All The Pretty Dresses: Oh my! 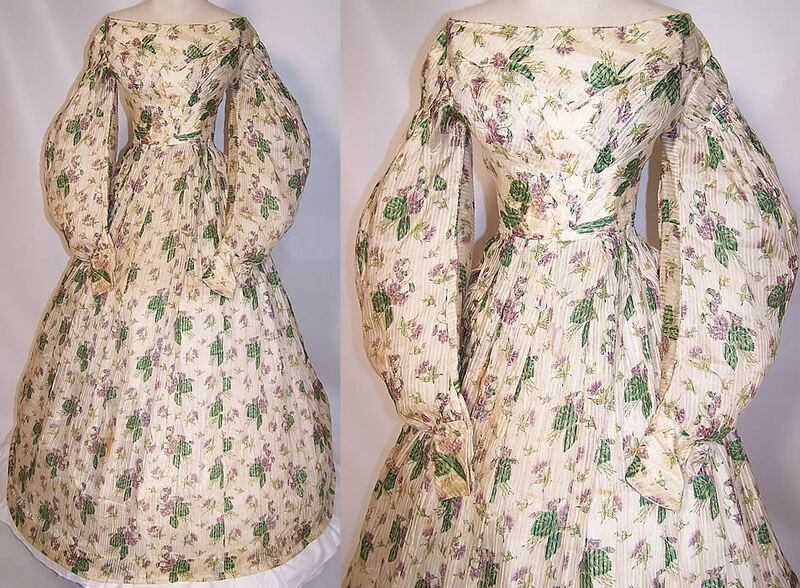 Romantic Era Print Dress. Oh my! 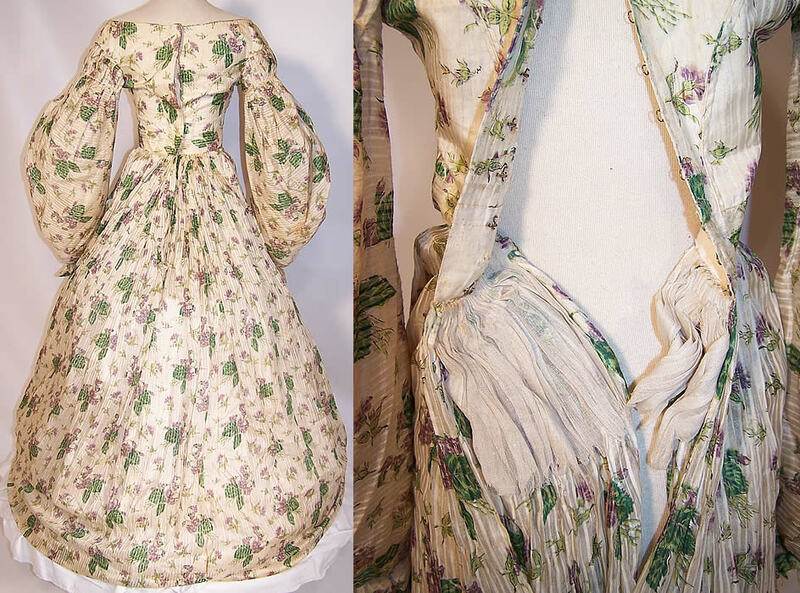 Romantic Era Print Dress. 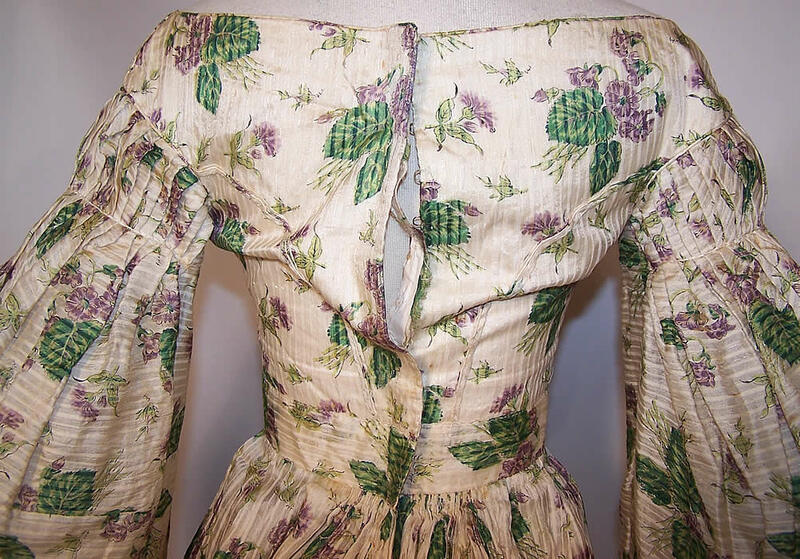 This antique Regency Georgian era violet flower print silk gigot sleeve gown dress dates from the 1830s. 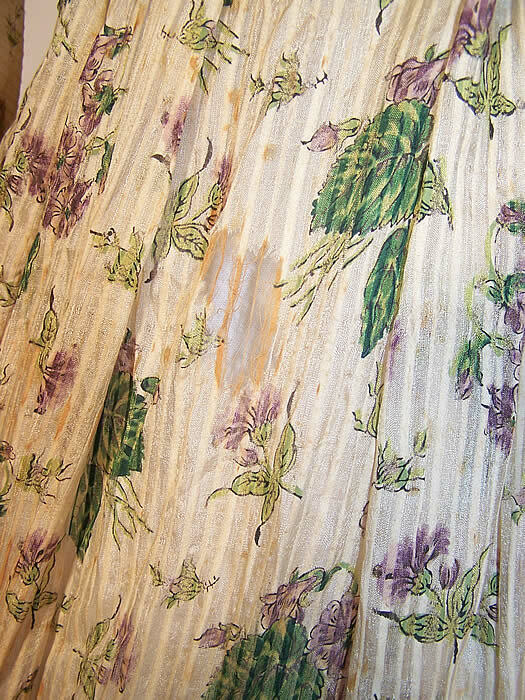 It is hand stitched, made of a sheer fine white striped silk fabric with a purple violet flower print pattern. The violet flower symbolizes modesty, virtue and affection. This gorgeous Georgian gown has a gigot leg of mutton style long full sleeve, a low off the shoulder neckline, fitted waistband, long floor length full hoop skirt and hook closures down the back. 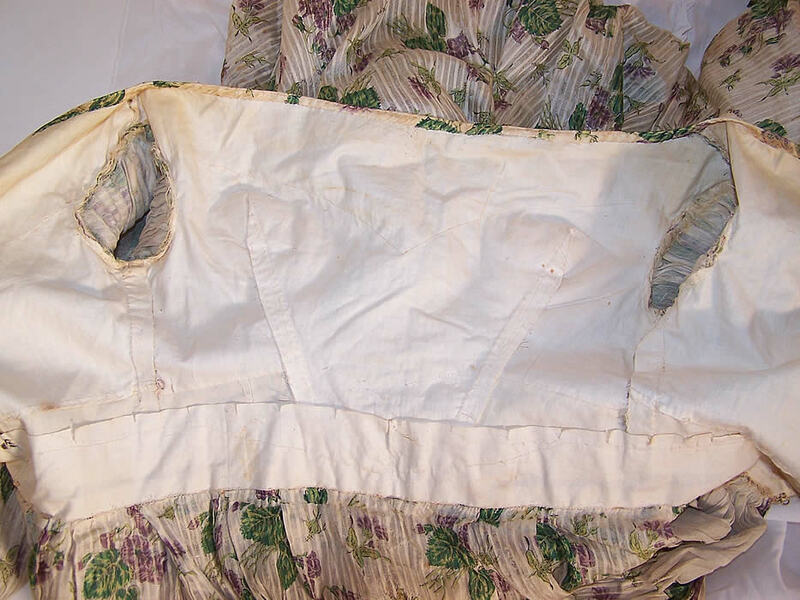 It is lined in the bodice only with a linen camisole top and the skirt is sheer, unlined with a crinoline fabric gathered panel inside the back waist area. The dress measures 52 inches long, with a 23 inch waist and 28 inch bust. It is in as-is fair condition, with several small frays, age spot stains and the back closure is ripped loose (see close-up). 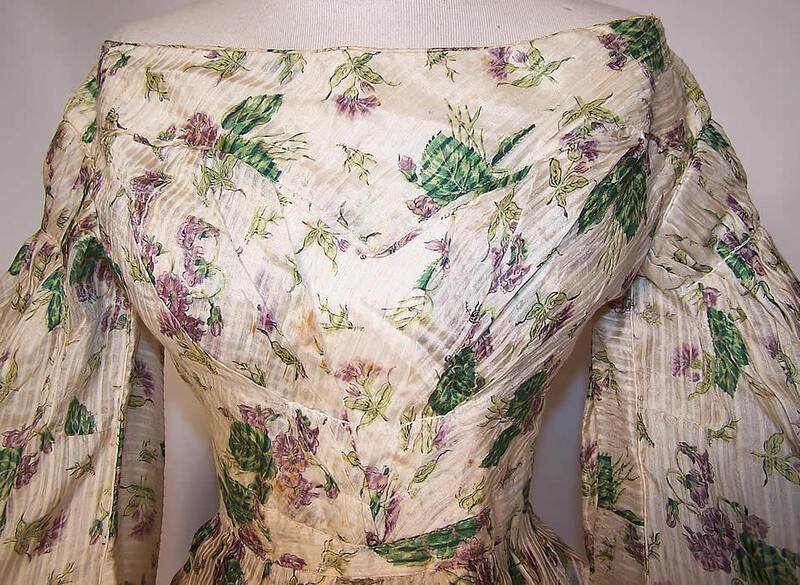 The provenance on the dress is it came from the Major Benjamin Swan House estate in Woodstock, Vermont and was supposedly used by Wallace Nutting in his photographs. This is truly a rare and early piece of Georgian era textile art! This is very late 1830's, going into the 1840's. 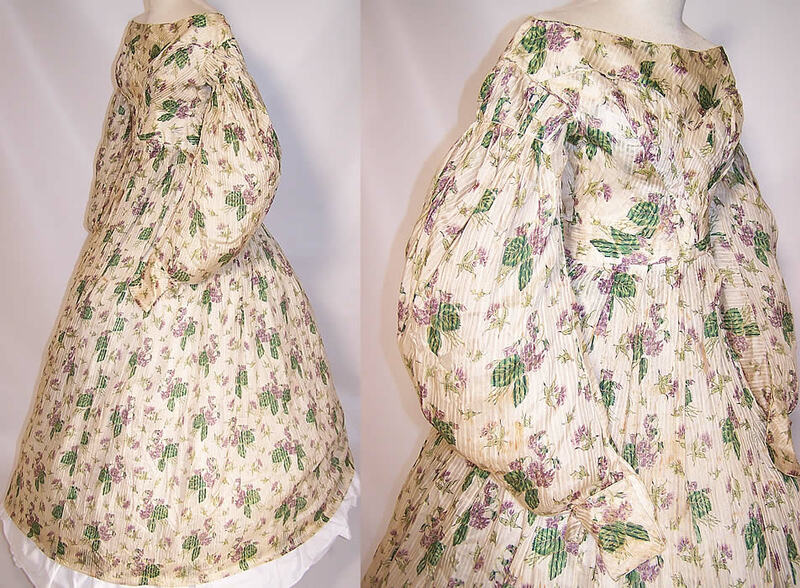 The sleeves are still very 1830's which is why I'm leaning that way rather than the 1840's. I love the print!